NEW YORK (LNS)–A little more than three years after the first Attica indictments were handed down at a snow-covered courthouse a few miles from Attica State Prison in upstate New York, the Attica defendants and their supporters have won an almost complete victory. For the defendants it has been a momentous task fighting a $4 million effort by the state to convict them. 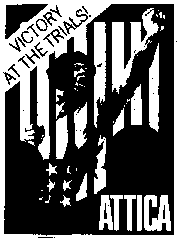 Beginning on December 20, 1972, fourteen months after the uprising, a special New York State prosecutor handed down the first of 42 indictments against 62 prisoners who were at Attica. It was the largest, most determined effort to prosecute and convict prisoners to date. Although 39 prisoners and guards were killed by police gunfire during the retaking of the prison, only one state trooper was eventually indicted. The indictment against the trooper on a minor charge of recklessly discharging a shotgun in the prison yard was also dropped on February 27, a scant few months after the indictment was issued. The sixty-two prisoners named in 42 indictments were charged with a total of 1,289 crimes. Since then, two defendants were convicted, five were acquitted in jury trials, and seven have pleaded guilty to lesser charges. Many of the earlier dismissals were for lack of evidence. The reason for asking for the most recent dismissal, the special Attica prosecutor Alfred J. Scotti admitted in court on February 26, was “flagrant deficiencies in the state police investigation of the retaking” of the prison. Scotti also conceded that the state prosecution had failed “to perceive these deficiencies” and would be unable to prosecute any state officials for police shotgun killings during the retaking of the prison. A spokesperson for Attica Now, Robert Cunningham, said that the defense was prepared to show a long chain of improper actions by the state in its prosecution efforts. This included, he said, the destruction of information favorable to the defense by the prosecution staff and state police, as well as selective prosecution of inmates since no real attempt had been made to indict state officials. Cunningham also said the defense was prepared to show that high state officials, including then Governor Nelson Rockefeller, had participated in meetings to cover-up crimes by state officials in retaking the prison, while at the same time setting the stage for the massive indictments against the prisoners. Left still unfinished for the Attica defense is the still pending charge against Dalou Asahi, and the conviction of two defendants, John Hill and Charlie Joe Pernasilice convicted of assault and murder of a prison guard. Amnesty for Hill, Pernasilice, and Dalou Asahi is a major priority of Attica Now, according to Cunningham.